Just yummy. All your pics are creamy and dreamy. You are so talented the way you display your vintage lovlies! Can't wait to see all the other lovliness on Sonia's blog party! Your home has a great deal of vintage charm, Debi. Thanks for sharing these photos with us. MINE IS ON ORDER! I can't wait!! How did you get yours so soon? I loved all these pictures of your home. It all looks so comfy and inviting. Ready for that all nighter yet? Your home is so romantic and beautiful. I can tell you have put your heart into making it very comfortable and beautiful. Everything is absolutely dripping with vintage charm, Debi! Love all the sweet views of your home--and your photography is--as always--just gorgeous! I always love to visit with you and your Vintage Charming home. And you are very talented and inspiring. Glad you enjoyed your copy. OH Debi, this is gorgeous! I must have this magazine. Yeah, like I need another one. I'm a magazine junkie! But this is beautiful. Thank you for sharing. I'll go check out her blog. Hi Debi - Your home is lovely - thanks for sharing your beautiful pictures. I just love the Rosettes that you make! 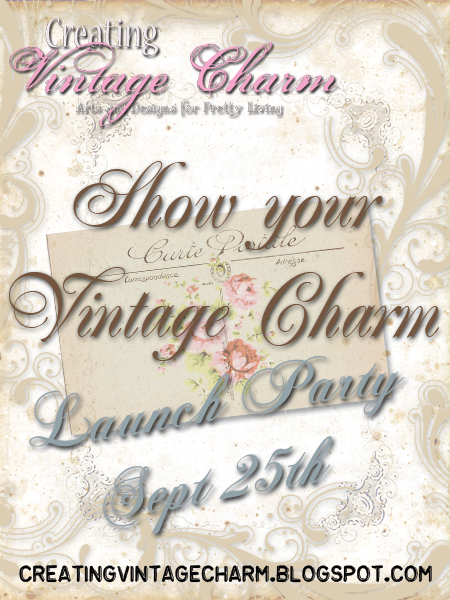 I can't wait to see the first edition of Creating Vintage Charm. Hi Debi, everything is beauitful, I like you love shopping at the thrift/opp and antique shops, it's where you fined the best prices, and beautifully aged items, I have enjoyed reading your post thank you. Your home is lovely and has all of the vintage charm that I love. Thanks for taking us on the tour. What a beautiful romantic home you have! Your photography and display is awesome as well!. Thanks for sharing these pictures, I really enjoyed you post!. Just beautiful. Talk about vintage charm. I wish I wereat home so i could share some of our charm...don't think I could match all your lovelies, though! Breathtaking post my friend! More beauty than I can possibly imagine! LOVE IT ALL! Nope...don't have the mag yet. But I'm off to check it out! 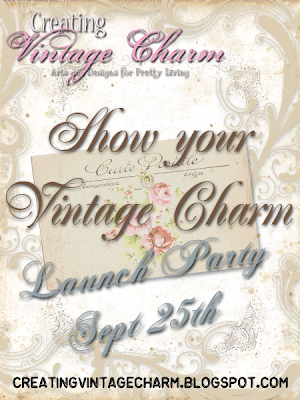 You have such "vintage Charm" Debi! Such a sweet post filled with pretties! thanks for joining the party ! tea is on at FHC ..
what a charming post! lovely pics and pretty peeks around your home. What a beautiful blog. I love all the pictures you posted. Everything is beautiful. It's great to meet you and I truly enjoyed my visit. I am now also following you. Hope you can come by for a visit. Enjoy the party! 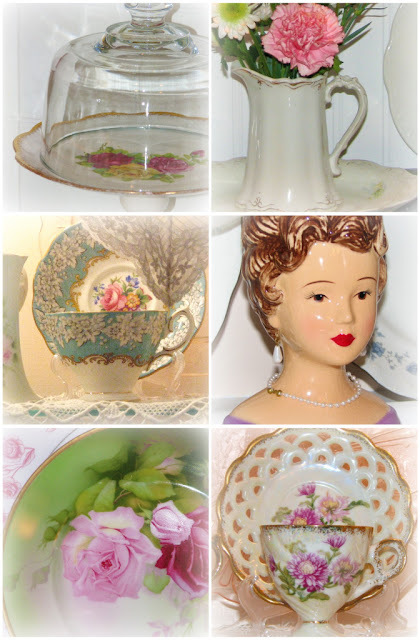 Thank you for sharing your darling Vintage Charm treasures. My goodness your home is gorgeous!!!!!!!!! !I am drooling over your deelish pics! I love it all too ... do you have trouble getting visitors to leave? i am so filled with the beauty and charm and romance of your post, dear, sweet debi! thanks for taking the time to show off your lovely treasures....high end shops are not for me either....second hand, one of a kind created by artists...handmade by my own hands....that's the good stuff to me! I have actually ordered this premier issue and I cannot wait until it is delivered to my door! if you think it's terrific....then I know I'm going to sink my teeth right into it over a good cup of coffee! drop by for tag tuesday! Lovely!! I really like this one! I ordered mine yesterday kept forgetting to get it ;) I cannot wait to see it! Hope it doesn't take long to ship! I have missed you lately , life has gotten in the way of blogging ;( I hate it when that happens ;) But I hope to be able to visit more soon! Darling this is the sweetest! Thanks for sharing wonderful you! Blessings. I didn't know about this magazine Debi, it looks gorgeous, so I will be on the look out for it. Thank you for sharing your beautiful photographs, they are so inspiring.